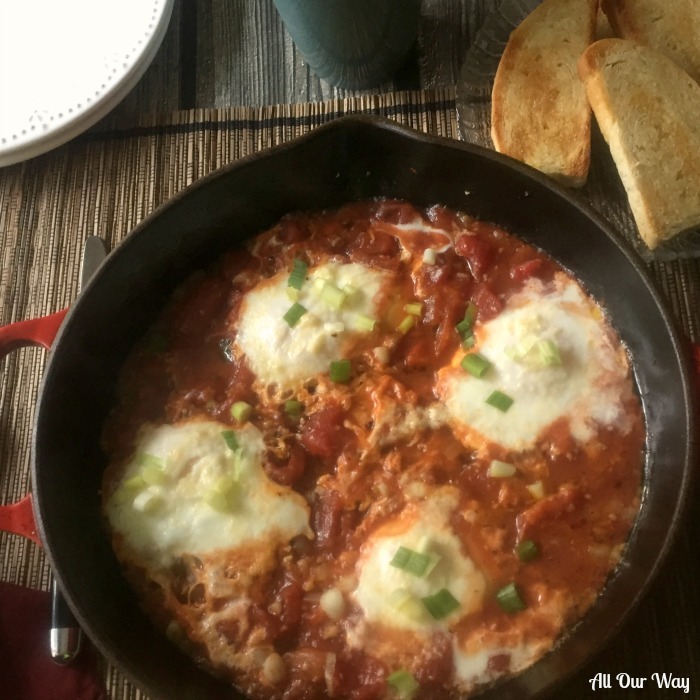 Spicy Eggs In Purgatory is a peppery, savory Italian dish Uova Piccante In Purgatorio. The eggs cook in a rich seasoned tomato sauce laced with Parmesan cheese. Served with ciabatta or polenta, it’s a perfect dish for brunch. Make it for breakfast when camping, it’s quick and easy. 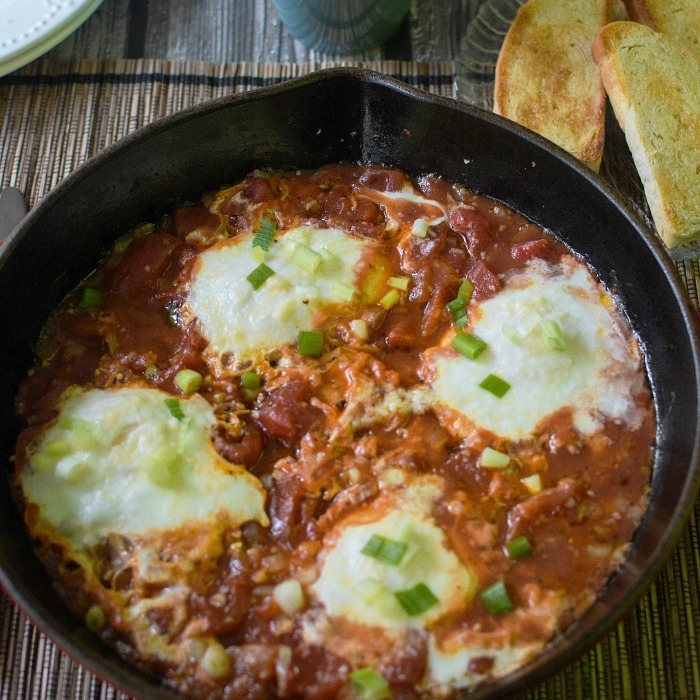 Spicy Eggs in Purgatory is a classic recipe that seems to be regaining popularity. I can’t open a cook book or surf the Internet without seeing some version of eggs poached in a spicy herbaceous tomato sauce. One of my favorite cookbook authors, Nigella Lawson, prepares and eats Uova in Purgatorio so she can feel heavenly. 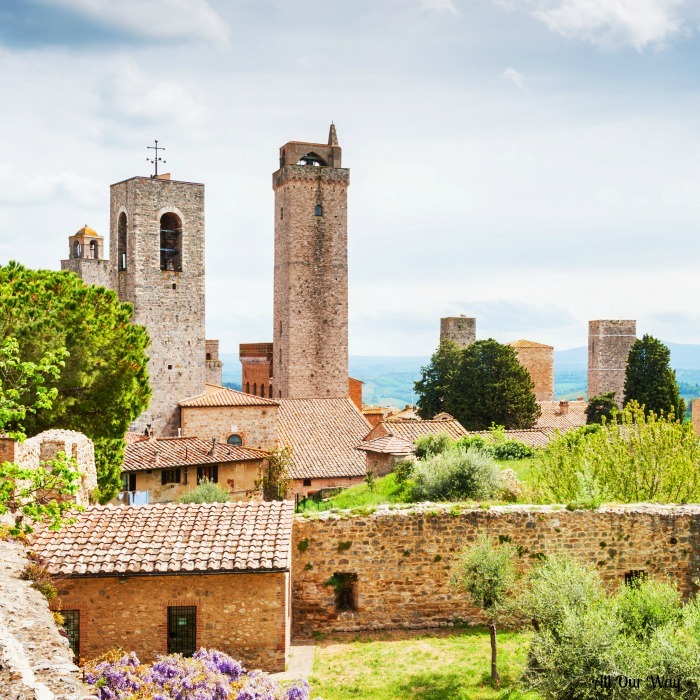 Giulia Scarpaleggia writes in her Italian cookbook, I Love Toscana, that she has fond memories of her nonna many summer evenings fixing uova al pomodoro. In his cookbook Dolce Vita, David Rocco tells how he’d take his mother’s tomato sauce, heat it up, then poach some eggs in her delicious sauce. In Italy, you’ll find spicy eggs in purgatory, called uova in purgatorio, uova all’inferno, or uova al pomodoro. Purgatory, limbo, and hell are associated with suffering and penance. But believe me, eating this peppery dish is no hardship — it’s devilishly good! 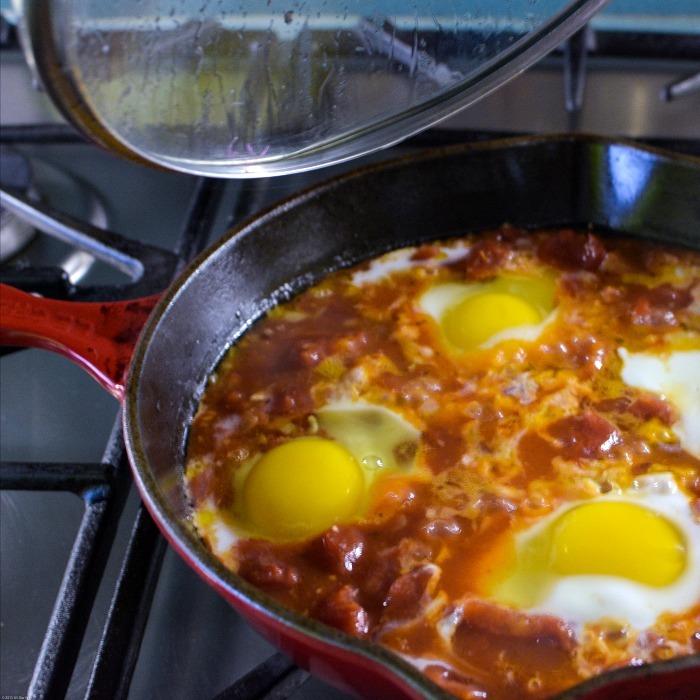 If you do an Internet search for eggs in tomato sauce, you’ll come up with an Italian version, a Middle Eastern version, a Mexican version, and an Andalusian version. Even campers like to toss in an egg or two into a pan over the open fire. I’m sure there are many more versions. 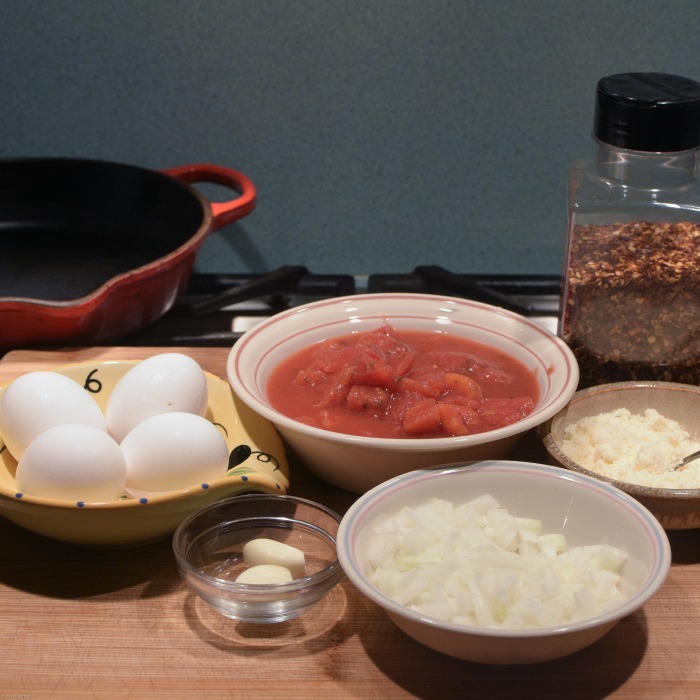 Shakshuka, a delicious combination of eggs, tomatoes, and spices, is of Middle Eastern, North African, and Israeli descent. 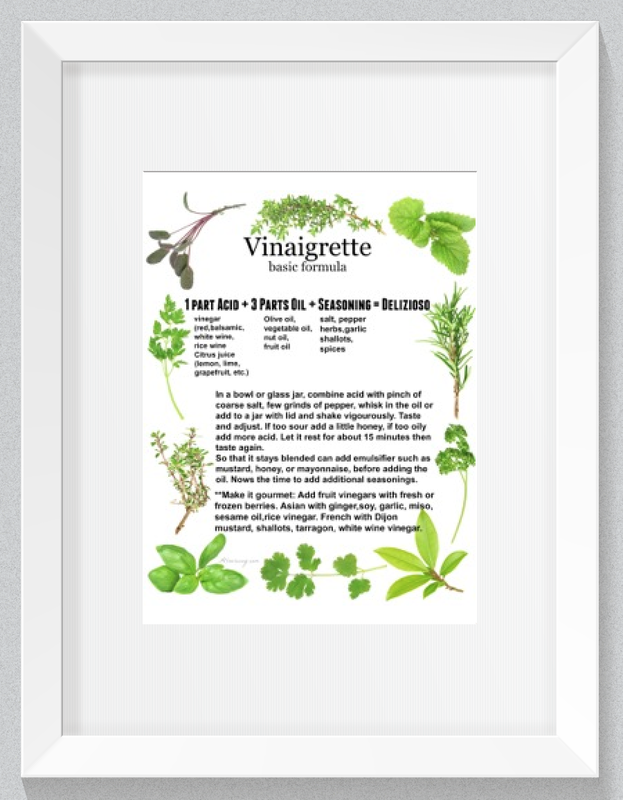 Deb, of Smitten Kitchn, has several variations on her blog. In the Southwest and Mexico, you’ll find Huevos Rancheros on most restaurant menus. The egg dish gets its kick from fresh and dried hot peppers. I’ve even seen a Mexican green sauce version made with tomatillos, cilantro, and scallions. 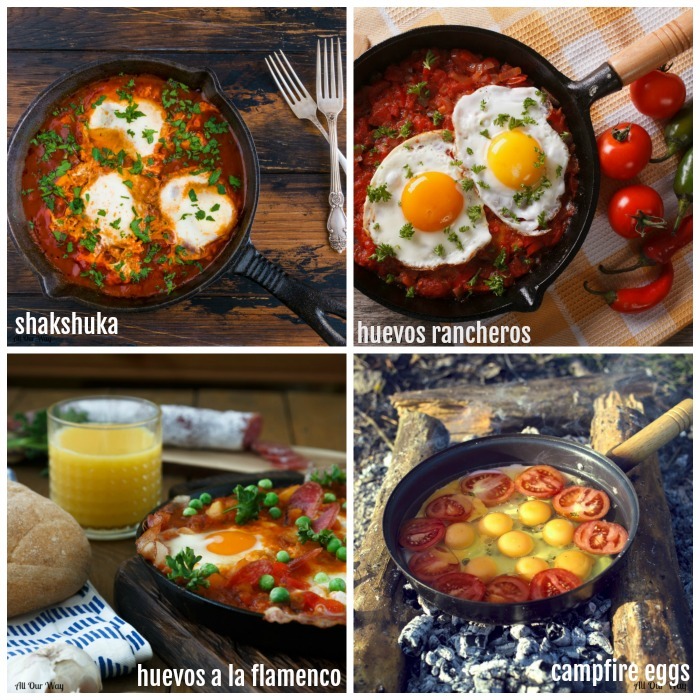 In Andalusia, you’ll find Huevos A La Flamenca. Poached eggs in tomato sauce with Serrano ham, chorizo, peppers, and peas. In many cultures, eggs were the only protein available. This type of dish made a satisfying and nutritious meal. For many years mammas and nonnas made this dish for a light lunch or dinner. Sometimes, eggs were the only protein available. That was the meal. Next to the poached eggs in tomato sauce were slices of homemade bread so that not one bit of sauce went to waste. Just like polenta, this dish of the contadino is now in vogue. I grew up eating simple country dishes. Mamma made everything taste wonderful — it was the special ingredient she put into it. Love. We hope you try the Spicy Eggs in Purgatory. It’s a quick dish you can make for one or many. It all depends on the size of your pan. Make it for a romantic Sunday brunch or a special family breakfast. Whatever you do, don’t forget the slices of rustic bread per fare la scarpetta. You’ll want to mop up every bit of sauce. We’re sure you’ll enjoy these savory and tasty dishes! The following are affiliate links. we are a participant in the Amazon Services LLC Associates Program, an affiliate advertising program designed to provide a means for us to earn fees by linking to Amazon. com and affiliated sites. This heavy duty cast iron skillet with lid is a must in our kitchen. We use it all the time. In fact ai rarely put it away because I’ll only have to drag it out again. Once you start using one and taking care of it you’ll never want to use anything else. Once you taste this breakfast dish you’ll be asking where have you been all of my life. It is so tasty and easy I know this will be a standard breakfast for years to come. It takes no time at all the only thing you must have is some delicious bread to sop up all the tomato goodness. See if we’re not right!! 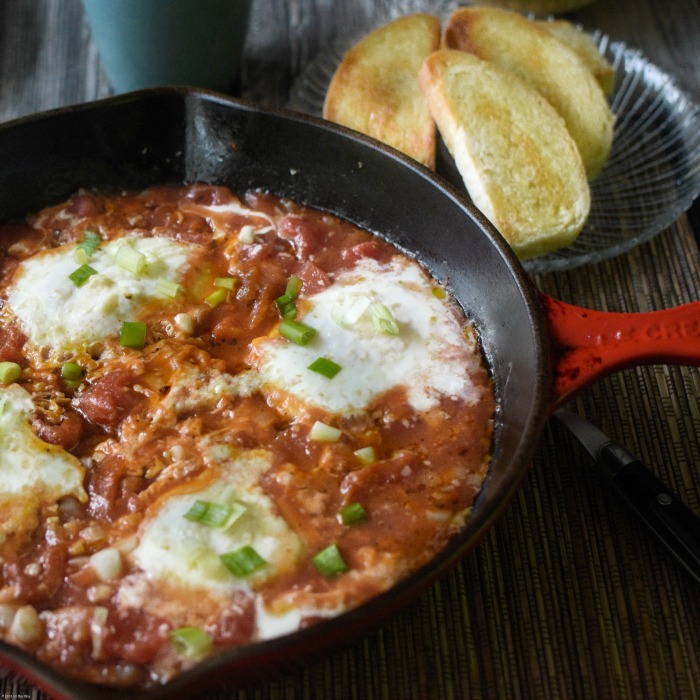 Spicy Eggs in Purgatory is a peppery Italian dish also called Uova in Purgatorio. The eggs poach in a rich seasoned tomato sauce that is laced with Parmesan Cheese. It's a perfect dish for brunch or a light lunch or dinner. It's quick and easy to prepare. 1/2 teaspoon Tuscany or Italian seasoning. Bread to soak up the delicious juice. Pour the olive oil into a heavy duty skillet and warm over medium heat. Add the pepper flakes, garlic, and onion. Stir for 2 -3 minutes being careful not to let the garlic brown. Add the tomatoes and stir in the Tuscan seasoning and salt. Let the tomatoes with sauce come to a simmer. It has to be hot enough to poach the eggs. Crack the eggs and let them slide into the juice. Sprinkle some Parmesan over the eggs, leaving some of the yolk still exposed. Partially cover with lid. Let it simmer for 5 minutes. The white should be set and the yolk still runny. It goes fast so keep an eye on it. Remove from the heat, sprinkle with basil leaves, green onions or both. Serve with a little more Parmesan and some bread to dunk in. You may add additional tomatoes and juice to the original can of tomatoes for extra sauce. Note: Recipes and content from © 2017 All Our Way are copyright protected. Please do not use content or recipe without prior written permission. If you want to share the information please link to this post. Grazie! My mouth is watering looking at these photos and reading about this delicious recipe! It’s the perfect dish for a family Sunday brunch! Wow this looks amazing!! I can’t wait to try it for breakfast next weekend. Pinned! I was watching a food show on the Food Network and one of them mentioned that eggs in purgatory is A MUST make dish for friends. I love that I can make this all at once and not have to worry about making any extra dishes for breakfast. Perfect to serve with mimosas for the New Year! I love ordering something like this when we go out for brunch. It’s so comforting and filling, and more than just eggs. Especially when you get to sop it up with crusty ciabatta! Love trying out new recipes. This egg dish looks so delicious. My husband will surely love this one? I love love love to have eggs in purgatory for breakfast or brunch on a weekend! A little spice kick is just what i want! This is a wonderful, tasty, dish we make often, for lunch or supper, especially in the summer with fresh garden tomatoes, but canned is good too. It has a funny name indeed 🙂 . Oh these sound amazing!! Perfect for a New Years breakfast! How fun! I love spicy foods and this egg in purgatory is right up my alley! It looks delicious and I bet it’s scrumptious taking crusty bread and soaking up the delicious sauce with the egg! My Italian-American father used to have my non-Italian mother make this for us when we were kids growing up in the 1960’s and 1970’s. There were four kids, so a lot of hungry mouths to feed. Sometimes she would put little round slices of pepperoni in it … that was our favorite. If she had no pepperoni, sometimes she’d even put little slices of hot dogs in it! But straight up, without the pepperoni, it was still good. I especially recall her making this for road trips in the summer. She’d take a whole loaf of regular American sandwich bread, cook this and pack it into sandwiches; then she’d use the original plastic bread sleeve and put the tomato/egg sandwiches back into it. We’d start our road trip, and about an hour into it, we’d find a picnic table along the highway or rest plaza, and we’d chow down on these sandwiches. I think the packing of the sandwiches into the bag and allowing them to set for a while makes a difference. They were moist, not too hot, and totally delicious. You could taste all the flavors instead of eating it too hot. What a wonderful story, Christine! So many memories are associated with food, aren’t there? Whenever we get together we sometimes start a conversation with remember when . . . and then we’d talk about food. Thank you for sharing the memory. Wow that looks yummilicious! That sauce looks tempting, can imagine mopping up that with a crusty bread!!! love how you have mixed other egg delights from other cuisines too! A hearty, healthy breakie/brunch !! I have tried all versions except for the Italian version. Looks super yummy and simple. I’m a lover of savory breakfasts but my family loves sweet breakfasts so we usually do both! Looks great. I am mostly familiar with shakshuka and I love it. Have to try this version as well. Hi, Mimi! It was such an easy and quick recipe. I was able to make this for Sunday brunch and enjoy my coffee while I just threw it together. I really love this idea – especially being spicy! Way to start the morning! What a yummy dish to make for the family this weekend. Hi, Kylee! Yep! We’re all about spicing up our lives. I dont know how many times I wanted to try this and havent now I really want to thank you for this great recipe! This recipe literally made my mouth water. My kind of brunch. Love all of these flavors and the history behind it. Can you believe I’ve never made this dish, ever? That has to change! We camp a lot and I bet I’d be the most popular breakfast cook in the camp if the others smelled this cooking! It looks so good – I love your authentic cooking! I love the name of this dish, it made me smile. I don’t believe I’ve ever had eggs in a tomato sauce before. I heard about this dish many times but never tried to make it. I love new breakfast ideas and definitely should make it! Try it, Veronika! I believe you’ll really enjoy it. We love new breakfast tastes, too. Love this spicy eggs tomato dish I like the Italian take on it , I think I can everyday because it has tomato sauce garlic and eggs. I have seen some what similar dish, Parsi Sali Par Eedu eggs in fried potato straws. Hello, Christine! Thank you for your nice comment. I am hungry just looking at this. Eggs are always the best breakfast, aren’t they? And I love all the Italy views. So lovely. Thank you, Aysegul! It is a great breakfast! !Have a wonderful weekend. Totally a cross culture favorite! I love this classic combination and how easy it is to make! You’re welcome, Noel! I can’t believe how easy it is, especially with the canned petite tomatoes. This dish looks and sounds delicious! A nice change from the ho hum breakfast. I know Gary would love the heat but not sure about the runny yolks. I’ll cook eggs a little longer for him. Hi, Susie! Well, our eggs did turn out a little harder than a runny yolk by the time I got done with the photos. But that’s okay because the flavor was fantastic. So you can make them to your taste. We will be leaving on Tuesday. Things are getting back to normal. Love and hugs to all!! Such a great recipe super easy and so flavorful. In my country we called them huevos ahogados or drowned eggs. Easy and so good for brunch or even dinner. Hi, Adriana! I know there must be quite a few countries that I missed. But they are certainly are excellent in whatever language. So much to learn each time I visit a post of yours Marisa! You always take time to explain about the recipe and it was fun to see how this simple dish is made in every cuisine. The recipe looks very easy to make and would love to dunk some bread into it. I am going to try this recipe soon. Looks so tempting. A quick meal for sure. Hello, Deepika! It is quick to make with little effort. I’m sure you’ll like it. I am not a fan of eggs at all, but my family loves them, so I make dishes with them as the star all the time. They would love this, especially since they also like spicy foods. What’s even better, Joanna, is that you can whip this up in no time! Just have some good dunking bread to soak up the delicious sauce. I love eating eggs this way. This is my go to dinner when I don’t really feel like spending time cooking…and beasts takeout hands down. 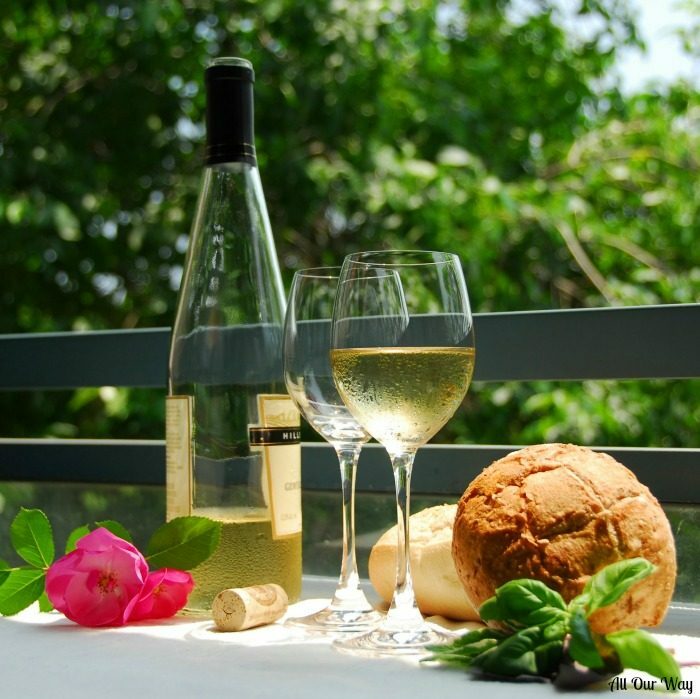 A nice fresh bread and a glass of wine…dinner is served!! Marisa, this sounds wonderful! But “ciabatta *or* polenta?” I want both with my spicy eggs! My husband will only eat scrambled eggs, but I want to try this out on friends. Hi, Jean! Why NOT do both polenta and ciabatta? That sauce turns out so good perhaps your hubby could be convinced to take a small taste of your delicious eggs? Have a great weekend. This looks so pretty Marisa. We have something similar in the middle east called Shakshuka. Also made with tomatoes, onions garlic. and peppers but minus the heat!. This would make a great weekend brunch for my kids. YUM! Thank you, Veena! It seems like every country has their own version of it with a few minor changes. It is so good!! Love eggs cooked this way. So delicious and it makes a beautiful presentation. Your recipe looks great- can’t wait to try it. Thank you, Jovina! This is certainly an easier recipe than an omelet. I loved the taste.